The world-famous Elon Musk, CEO Tesla, announced an entry to the energy storage market in 2015 with the launch of the home battery product, the Tesla Powerwall. Perhaps more famous for their electric vehicles, Tesla Motors have been praised for their ability to make leaps and bounds in research and development. How Much Does The Tesla Powerwall 2 Cost? In 2017 the Tesla Powerwall 2 launched with the cheapest price point at ~$8000 for 13kWh in the residential battery market. Since then, challenges in production quantities, have led to increases in their retail price $9,600 plus installation costs. In Australia, across our network of over 150 solar installers we expect this installed cost of a Tesla Powerwall 2 to cost between $11,000 and $13,000 excluding Solar PV. Whether the Tesla Powerwall 2 is a cost effective product for your system will depend on a closer examination of your electricity needs. To see if home solar battery storage is worth it, our detailed Solar Battery Sizing and Payback calculator to see the financials for your system. Batteries have a positive cathode, a negative anode and are separated by an electrolyte in a simple view of a battery. 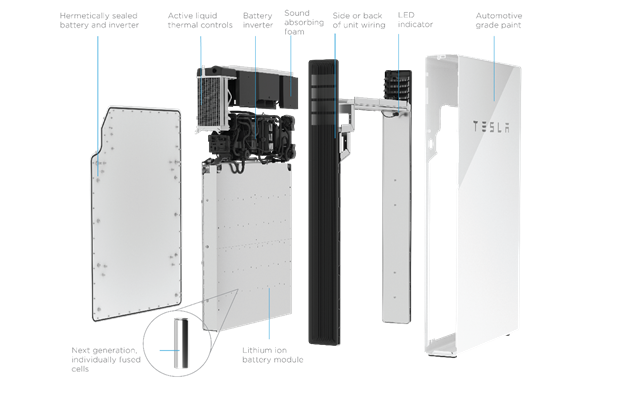 The Tesla Powerwall 2 uses Lithium-ion technology where the cathodes are made from a compound of Lithium, Cobalt, Nickel and Manganese (LiNiMnCoO2). Other lithium battery chemistries in the on-grid home battery storage market include lithium iron phosphate (LiFePO4) and lithium cobalt oxide (LiCoO2). How will a Tesla Powerwall 2 Perform? The battery comes with a 10 year warranty and offers 5kW of output power catering to most large residential homes and multiple batteries can be daisy-chained together for commercial usage. The battery is 1.15m by 0.76m and can be wall-mounted indoors or outdoors. 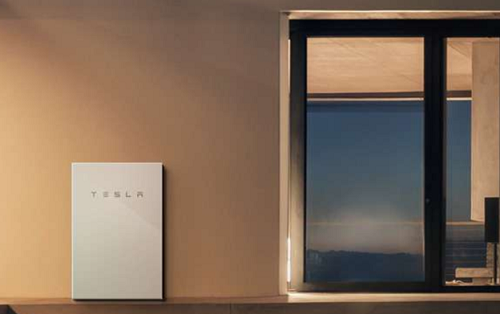 If installed in combination with an additional ‘back-up’ component, the Tesla Powerwall 2 can be designed to provide power during a blackout. 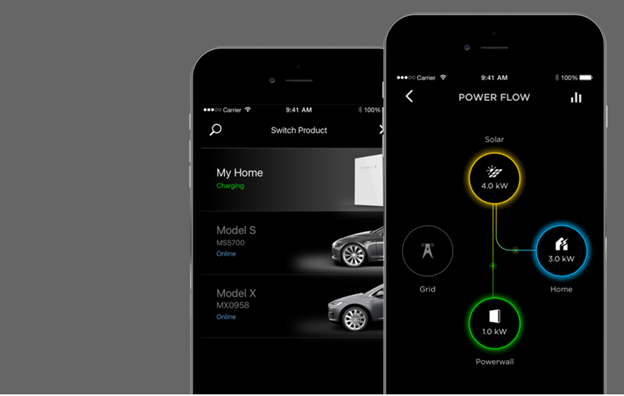 Tesla have developed a mobile app, supported on andriod and iOS app stores. This enables users to view the real-time operation and performance history of their Tesla Powerwall 2 and if applicable their Tesla EV as well. App users can monitor system performance if combined with Solar PV and can switch the battery between 3 modes: Back-Up only, Self-powered and Time-based control. Back Up Only – switches the battery to store all possible energy and keep the battery full. This means in the event of a black out power will continue for the system and can potentially last for weeks if coupled with a sufficiently sized Solar PV system. Self Powered – This mode maxmised the financial utility of the battery enabling a household to capatilise on as much free energy from their rooftop prior to drawing any energy from the grid and incurring a cost from their local electricity retailer. This is the common purpose for residential batteries as homeowners seek to tackle evening and early morning power usage. Time-based Control – If the owner has a time-based electricity charge from their retailer, then the Tesla Powerwall 2 has the smarts to charge only at the ‘off-peak’ rates and discharge the power at peak rates. The actual financial benefit available depends on the tariffs of the electricity retailer, but are generally insufficient to merit the investment into a battery system alone. How do I get a Tesla Powerwall 2 battery? To get a Tesla Powerwall 2 you need a local Tesla-accredited solar installer. You can click here to get a free quote comparison from up to 7 local installers near your home. I was just looking at Tesla’s website…they say the cost of a Powerwall 2 including supporting hardware is $12350 and typical installation cost is between $1450 & $4400. The price you’ve mentioned above is a little below that. What are your thoughts on this? Am I missing something? Assumption would be that solar installers accredited with Tesla have access to better prices than they publish on the web. As with all things solar there is likely to be a wide range of quoted prices if you get a few, so worth making sure you’re dealing with a good quality, reliable installer. That said, $4,400 would be very high for battery installation which can be done in half a day, and would likely be resultant of requirements to upgrade switchboards or other non-standard variations. We have installed a few Powerwall 2’s…labelling of the Battery technology is required…..we have spoken to Tesla engineers, they confirmed the powerwall 2 is lithium iron phosphate (LiFePO4)…..not cobalt…as the data sheet specifies….go figure! Me…I like…Ni-FE battery bank in parallel with Ultra capacitor bank…..will outlast the PV array! !….very cool combination!